Looking from my bedroom window down on the Arab neighborhood beneath me I see many things in the streets of Jerusalem. Men carrying round necklaces of prayer beads while wearing coats over floor-length skirts, heads draped with red or white-checked shoulder length scarves tied with a narrow black rope giving the appearance of the Palestinian leader, Yasser Arafat. Women also wearing floor length coats and scarves wrapped snugly around their heads loosely falling down onto their shoulders. Then often in groups of three I see tall skinny men in black pants, matching jackets and top hats surrounded by a four inch brim; one 5-inch long curl covering both side burns which bounces as they walk staring straight ahead never looking at passing strangers. Some of the ultra-Orthodox Jewish men wear a more prestigious round fur hat that rises at least 8 inches up from the crown of their heads indicating their origin from Russia and their position in the Jewish synagogue. I’ve even seen an occasional monk dressed in a brown robe with a rope belted loosely around their waist and a carefully shaven bald spot on the top of their heads signifying the Franciscan order taken after St. Francis of Assisi. The traditional Westerner sprinkles the landscape in their jeans, tee shirts, jackets and fashionable boots or Nikes. 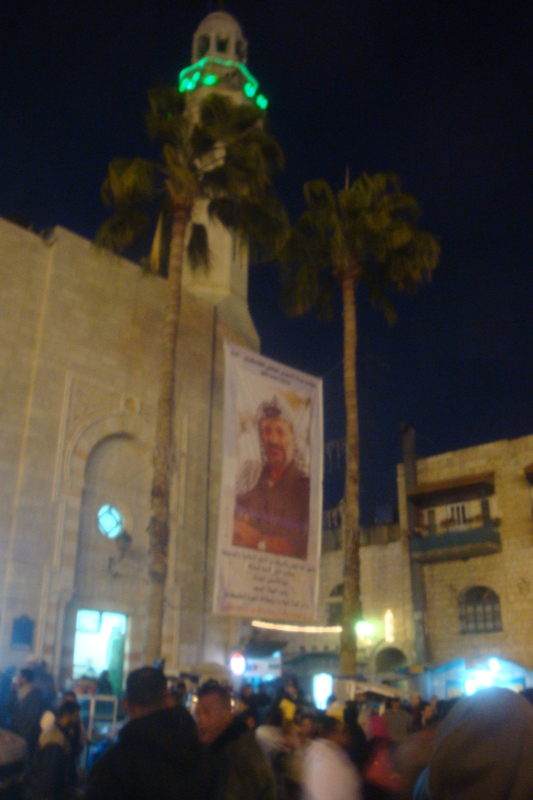 We are across the street from the Damascus Gate in the old part of Jerusalem. When you enter the gate you are surrounded by small stands similar to our farmer’s markets but which fit nicely into alcoves along the walls and close up for the night by pulling down a metal door which pad locks at the bottom. As you walk down the narrow passageways on slick, smooth stones worn by centuries of walking inside the old city crowded with people of all nationalities, you are careful not to slip because of the incline or bump into someone bustling around. While I’m looking out my window, I’m wondering where all these hundreds of Jews are going. 45 minutes later I see the same people passing by my window again going in the opposite direction. I couldn’t sit and watch any longer; I wanted to know where they all go and perhaps join them. I put on my long grey skirt hoping that maybe I could sneak into their synagogue and watch without being too obvious. I woke Chuck up from his nap and off we went at 6:00 p.m. on the Sabbath which is a Friday evening to follow them. I looked for someone to question and found a young woman passing by. At that same moment an elderly man with the tall fur hat asked me in English what I wanted to know. 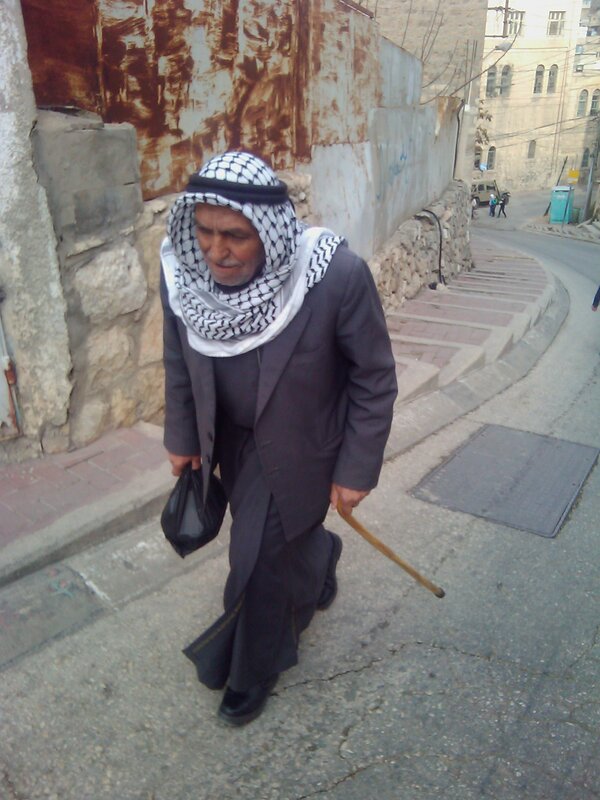 Since most of the Jews only speak Hebrew I was quite relieved, “Where did all the Jews go in the old part of Jerusalem and where are they going now?” I asked. His eyes refused to look at me but he clearly wanted to answer my questions, “We all went to the Wailing Wall to pray and now we are returning to our respective homes. Any thing else you want to know?” I was taken aback and could only thank him for the information. 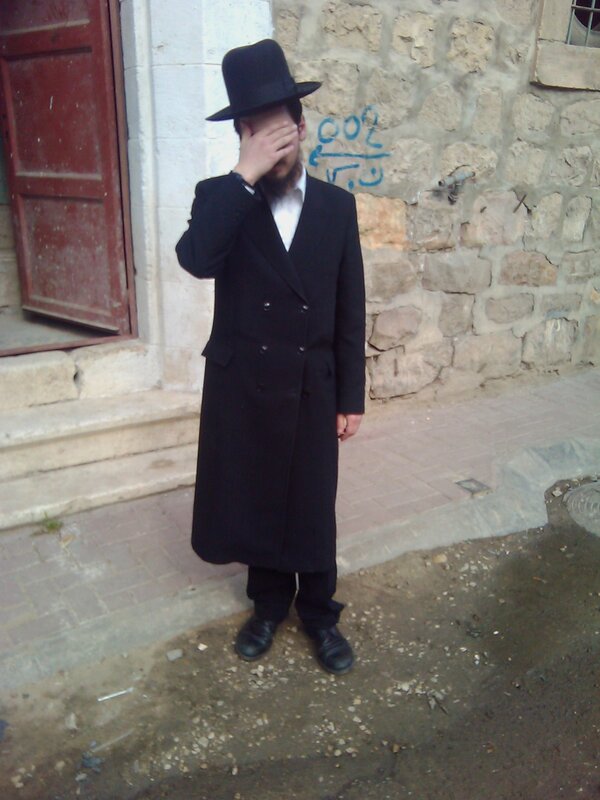 A few minutes later I found two young Jewish men wearing black top hats with a four inch rims under which lay small round kippah or yarmulke (also called “skull caps”). I asked them if they would tell me something about their Jewish practices. They said that they had just come from South Africa 2 years ago and were learning to love God; that it was difficult to follow the Jewish traditions but that they were learning; and that they read the Talmud regularly. Because I didn’t know what the Talmud consisted of they explained that their primary book is the Talmud which explains the Torah or the first 5 books of the Bible. They went on their way. Curiously I began to read the Talmud and other important books read by the ultra-Orthodox Jews and found something very alarming: The Jew is instructed by these rabbinical writings not to associate with the Gentile (any non-Jew), or respect them or be honest with them. According to the Talmud Christians are unworthy to associate with Jews; are considered unclean, idolaters, and evil. So I discovered that there are many kinds of Jews: the ultra-Orthodox Jew who adheres tightly to the Jewish rabbinical texts such as the Talmud, the orthodox Jew who loves and tolerates other people’s religions, the secular unbeliever, and the Messianic or Christian Jew who remains a Jew but believes Christ is the long-awaited Messiah. I began to study Jewish history apart from the Bible and found other astonishing facts: The first record of the name Israel occurs in 1209 BCE. “Israel” was seen as a cultural ethnic group rather than an organized state until 1948 (http://en.wikipedia.org/wiki/ History_of_Israel#cite_note-1) In Zionist history, the different waves of Jewish settlements are known as ‘aliyah‘. During the First Aliyah, between 1882 and 1903, approximately 35,000 Jews moved to Palestine. In 1896 Theodor Herzl published “Der Judenstaat” (‘The Jewish State’) in which he asserted that the solution to growing anti-Semitism in Europe was to establish a Jewish state. Between 1904 and 1914, around 40,000 Jews settled in Palestine (the Second Aliyah‘). In 1908 the Zionist Organization set up the Palestine Bureau in Jaffa and began to adopt a systematic Jewish settlement policy in Palestine. The first entirely Hebrew-speaking city, was established in 1909 (later renamed Tel Aviv). In May of 1948, a few years after the holocaust, Israel became recognized as a Jewish state and a refuge for the Jews. I reflected on what I’ve been learning the past couple weeks about the Jews. I’ve read the Old Testament forward and back many times over the past twenty years becoming more and more acquainted with the history of Israel, but it never occurred to me until now that Israel ceased to be a nation at the same time the final stories of the Bible were completed. The last books of the Bible were written by the apostle John around the time of the Roman takeover and Israel was no longer. Just as the prophets, Ezekiel 21, Jeremiah, and Isaiah foretold 700+ years B.C. all the Israelites would be either killed by the sword, famine, disease or dispersed among the nations. Isaiah 6:9-13 foretold that the Lord God would harden their hearts, blind their eyes, and deafen their ears so that they would not appreciate the coming of Jesus and recognize Him as the Messiah . As a result, the message of the son of God could be dispersed throughout the nations and the Gentiles would be grafted in (Romans 9, 10,11). But the Old Testament prophets don’t stop there. In Zechariah 8-10 they claimed that the Lord God intends to bring the Jews back to Israel, treat them gently and soften their hearts so that they might come to recognize Yeshua (Jesus) their Messiah. It is in this period in history that the Jewish people have a place they can call their own, finally after 2,000 years of being displaced, a Jewish state has been formed. 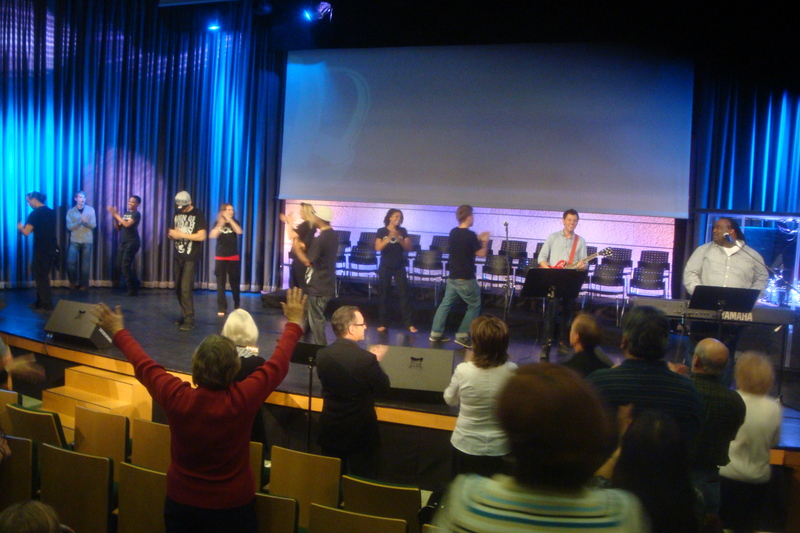 Jerusalem, “the apple of God’s eye” is being restored as a place of worship by the Lord for His remnant. 1/3/2012 On Christams day we visited the King of Kings congregation and saw this group of youth being menitored in Christ by Eddie James who have been traveling the world sharing their testimonies of Christ’ s changing power in their lives. Later that evening we heard the whole Handel’s Messiah performed in Hebrew by members of the Jerusalem Symphony orchestra; the program was filled with the scriptual refences to all the movements and the Holy Spirit elevated our vision of His power and plan over al the earth.